Ming the Mechanic: Where are the podcars? Unlike mass transit, podcars carry two to 10 passengers, giving travelers the freedom and privacy of their own car while reducing the use of fossil fuels, reducing traffic congestion and freeing up space now monopolized by parking. At stations located every block or every half-mile, depending on the need, a rider enters a destination on a computerized pad, and a car would take the person nonstop to the location. Stations would have slanted pull-in bays so that some cars could stop for passengers, while others could continue unimpeded on the main course. "It works almost like an elevator, but horizontally," said Roberts, adding podcar travel would be safer than automobile travel. The podcar is not entirely new. A limited version with larger cars carrying up to 15 passengers was built in 1975 in Morgantown, West Virginia, and still transports West Virginia University students. 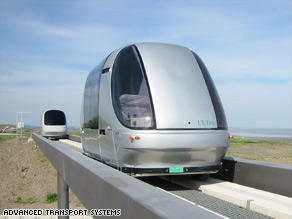 Next year, Heathrow Airport outside London will unveil a pilot podcar system to ferry air travelers on the ground. Companies in Sweden, Poland and Korea are already operating full-scale test tracks to demonstrate the feasibility. Designers are planning a podcar network for Masdar City, outside Abu Dhabi, which is being built as the world's first zero-carbon, zero-waste city. Meanwhile, more than a dozen cities in Sweden are planning podcar systems as part of the country's commitment to be fossil-fuel-free by 2020, said Hans Lindqvist, a councilman from Varmdo, Sweden, and chairman of Kompass, an association of groups and municipalities behind the Swedish initiative. Yeah, sounds great. But "not entirely new" is a bit of an understatement. I feel cheated. Where's my future? When I was a kid, in the 60s, my mother subscribed to a popular science magazine called "Vor Viden" (Danish for "Our Knowledge"). Which every month was chock-full of exiting technological marvels that were just around the corner. Like, exactly this pod car scenario. According to that magazine, there had already been test tracks constructed in Germany and other places, and there were photos, which looked very much like these photos. It all sounded very promising, like it would be coming to my neighborhood in a few years. But we're talking about the mid 60s. 40 years ago. It obviously didn't happen so far, and maybe you can understand if I'm a bit skeptical when I read almost the exact same article four decades later, and I'm supposed to believe it. I'd like to believe. But there were also functioning flying cars in the 1960s. And amphibian cars. And we went to the moon in the 1960s. And to the bottom of the Mariana Trench. I'd have expected that we would have gotten a bit further along those lines since then, but it hasn't been much. But we have color TV. Oh, and the internet and mobile phones. Some things are actually better than predicted in the popular science magazines of the 60s. But it is a little silly and unexpected that we're still driving cars with motors that run on exploding fossils. And that we sit and push pedals and turn steering wheels. Seems a bit like the Flintstones, which incidentally was one of my favorite TV program in the 60s. I had just hoped for the Jetsons. “Wired” systems that put a lot of effort into the pathways and make the objects moving on them lightweight and simple — pneumatic tubes, railroads, land telephone lines — are generally more efficient. But the high cost of the infrastructure leads to monopolies, which leads to future inefficiency. In contrast, “wireless” systems that put minimal, if any, effort into the pathways and make the objects complex and autonomous — bicycles, cars, cell phones — are less efficient initially, but there's usually more competition, which leads to future efficiencies. In addition, these days we have to worry about “wired” systems being terrorist targets, and people tend to prefer the freedom and independence that the “wireless” versions give. So as much as I like podcars, maglev, transatlantic tubes, and the burrito delivery tunnel, I think the “wireless” equivalents are generally going to win out in the marketplace. Yeah, I can remember those future scenarios too out of Popular Mechanics (and its Danish counterpart) - especially the cars that could find their way on their own. What I also remember was, that it was also reported in the early seventies that the use of FCKW-gases would make the ozone-layer deteriorate. resembles the antigrav car that flew over my head about 4 to 5 months ago. I was out chopping wood in my yeard and suddenly there it was! I had the distinct feeling that there were people inside watching me as it flew form SE to Northwest vanishing into a cloud bank. I stood there stunned, a bit, thinking that I'd just witnessed a major hidden tech event and wondering why my minds eye was filled with pictures of the people inside it. While I was contemplating all this, about 5 minutes had passed, it suddenly appears coming from the NW flying SE, again! I watched it fly into another cloud bamnk and disappear. are now happily up and running at Heathrow - and strangely from my observations they seem to inherited that curious bunching tendency that their big relatives [buses] are so prone to. It is slightly surreal seeing this procession on its elevated track and having to remind yourself that this for real and not a film - and it is probably the beginning of a global revolution that will vastly improve life in cities and restore the bar/pub to prosperity. The Indian cities are planning some extensive systems to try and ease their grid lock, have a look at ULTra's site http://www.ultraprt.com/news/89/149/May-2011-News-LHR-HSR-India-Apple-tools/ where there is a wealth of interesting stuff including a free simulation tool so you can design your own system! Hello Dear, are you really visiting this web site regularly, if so then you will without doubt obtain good know-how.